Overwatch League Fantasy: Should you start players in sweeps? In fantasy football, team match-ups play a huge role in deciding when to start and bench players - fantasy owners usually starting wide-receivers against the Jets (who allowed an average of 28.5 fantasy points per game to WR in 2018), but tended to sit anyone who wasn't a superstar against the Jaguars (who allowed just 16.8 points per game to WR in 2018, best in the NFL). Overwatch Fantasy is little different - fantasy owners should pay close attention to who teams are playing against - team strength can play a huge role in your fantasy points. 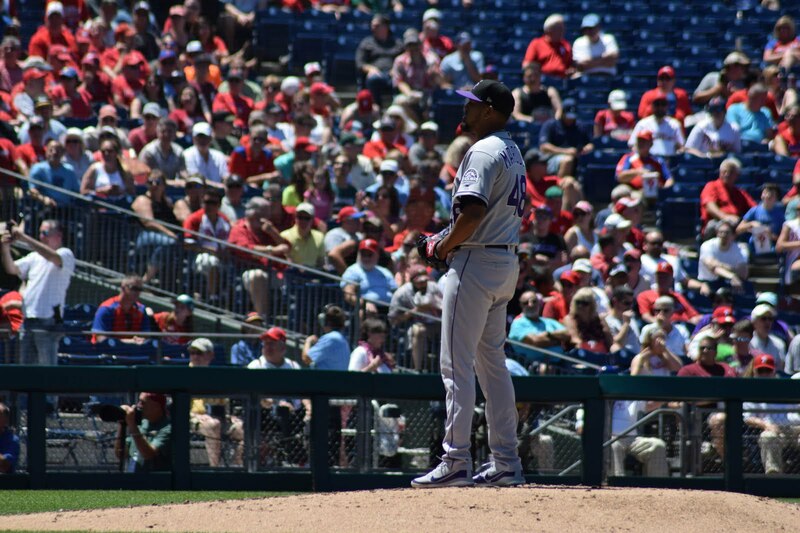 Should you start a player even when you think their team will get curb-stomped? How about when you think your team will do the curb-stomping? What about betting on a crucial fifth map, where players can boost their play time with some extra minutes? Here's your guide to figuring out who/when to start in the Overwatch League based on how you think team units will play. The word "Map" is used to refer to a single discrete instance of team competition within an Overwatch League game, or "Match". An example of a map might be Busan, Dorado, or Route 66. The word "Match" is used to refer to multiple maps which are played in a game. Teams generally play four maps in a single match but may play a fifth map should the teams be tied after playing four maps. To determine when you should be starting and sitting players in matchups, we'll first need to establish baselines for fantasy play. We'll use OWL Stats from 2018's regular season with HighNoon.GG's fantasy scoring system. It is of note that these stats represent fantasy stats from a 2/2/2 meta as opposed to a GOATS meta, but much of the same principles hold true as we are generally looking at the view from 20,000 feet as opposed to breaking these stats down by hero-choice or role. One of the considerations in terms of starting/sitting might be who is expected to win and lose a game. In general, winning teams record an average of 101.76 fantasy points per match per role slot, and losing teams recorded 88.42 fantasy points per match per role slot. This revelation is patently obvious - fantasy points generally measure positive objectives, and a team will reach these objectives frequently en route to winning. However, it is of note that this differential comes almost entirely from eliminations. There is almost a ten-point spread in eliminations between winning and losing teams, but only a two-point spread in damage and less than 0.2-point spread in healing. This result suggests that main-supports whose value largely comes from healing, such as Unkoe, Gido, and Revenge, do not necessarily need to have the outcome of the match factored into the decision to start or sit those players. Again, it is not unreasonable to expect players to perform poorly against better opponents, but this information confirms that it is more difficult for players - especially elim-heavy fantasy players - to rack up more fantasy points in losses than wins. This information indicates that expected match outcome is a non-factor in determining whether or not to start a main-support player, yet it may be worthwhile to bench a DPS player who relies on eliminations for points should you anticipate that they may be walking into a potential loss for an inferior DPS player playing for a team who expects to win. There are a number of different lines of thinking in starting fantasy players when taking into team strength into consideration. We will define three different rationalizations, and then objectively examine them. Please do not read too much into my characterizations of each team - the point is not how I evaluate each team, rather, they are names ascribed to examples of teams of fictional strength. A fantasy owner owns Meko, a player for the notable powerhouse NYXL. NYXL's only match this week is against the Florida Mayhem, a fairly poor team that NYXL is expected to sweep with ease. The fantasy manager starts Meko on the grounds that Meko will pick up many points in an easy victory over an inferior Mayhem team. However, should this manager consider that these games may be over more quickly, thus robbing Meko of the chance to pick up more fantasy points? A fantasy owner owns Geguri, a player for the fairly weak Shanghai Dragons. The Dragons' only match this week is against the Philadelphia Fusion, the runner-ups from the Overwatch League championships in 2018 and a very strong team this season, and are overwhelmingly favored. The fantasy manager starts Geguri on the basis that she is an excellent flex-tank. However, will Geguri's production struggle given that she is playing against a superior team and that, in a sweep, the games may be over more quickly? A fantasy owner owns Shadowburn, a player for the middle-of-the-road Paris Eternal. The Eternal play the Atlanta Reign in their only match this week, and it is expected to be a close and tight game. Despite the fact that Shadowburn may be receiving a healthy degree of competition, the owner starts Shadowburn on the basis that the games will be long and drawn out, thus giving Shadowburn more time to accumulate fantasy points. Which of these lines of thinking are logical? Let's examine how many fantasy points players in different map spreads tend to receive. There are a number of map-differentials that teams might encounter. A clean sweep represents a 4-0, a somewhat closer match would result in a 3-1 win, and a tied match after four maps means that one team will be walking away with a 3-2 win. There is also the possibility for draws, meaning that 3-0 and 2-1 outcomes are possible. In general, 3-2 matches tend to be the most productive in terms of fantasy outcomes for both teams - indicating that scenario C represents the greatest potential for fantasy points in a vacuum. It is also apparent that 3-2 wins and losses are dragging the averages for wins and losses overall upwards. Starting a player in a game where the team is expected to win 3-1 or 4-0 represents an average fantasy opportunity, with both values appreciably close to the overall average for fantasy points per game per player slot. However, starting a player in a game that they might be expected to lose 4-0 means that they might stand to finish in excess of twenty points below average - a significant handicap. However, evenly matched games present the greatest fantasy opportunity - a match which goes to a fifth map represents an opportunity for about fifteen additional points for players on both sides. These kinds of match-ups should be targeted - given two players of identical caliber, the correct play is to start the player in the match that would be more evenly matched. By a back-of-the-napkin calculation, it certainly appears as though starting players in evenly matched games is worth the risk of the 3-1 or 4-0 as our expected gain in terms of average points is positive (+2.07). Why might players stand to gain so much from playing in close 3-2 matches? It certainly appears to be match-time. 3-2 matches do, by virtue of that fifth map, record significantly more play-time than other match differentials. However, we should not discount the possibility of the strength of competition driving point totals as well. In terms of rate stats, it appears as though evenly matched teams post average point differentials against each other, whereas teams curb-stomping opponents generate a high degree of points-per-ten minutes (league average of 17.79 points per 10 minutes). Yet, as demonstrated above, the difference in rates of accumulation does not compensate for the brevity of four-map games. It is also of note that games with drawn-maps also tend to display longer times and similar points-per-ten - indicating that these games are quite close as well. However, map draws are fairly rare and unpredictable enough that I have felt comfortable not including them in the larger discussion of this analysis. There is a natural question of, "The chicken or the egg": do fantasy teams truly post high totals by virtue of winning, or do they simply accumulate these high totals en route to winning, and we are mistaking the disease for the symptom? It is obvious that evenly matched teams present an opportunity for additional points by virtue of the fifth map, yet teams who win tend to simply have better players overall, and this is what is ultimately measured by fantasy points, not simply wins. The answer is, it is probably both the chicken and the egg. In baseball, it is rather easy for a good player to have an excellent performance in a losing effort - like Mike Trout going 2-3 with two doubles and a walk in an 8-2 loss - but it is more difficult to accomplish that feat in Overwatch, especially in a GOATs meta where getting the first kill tends to result in the rest of the team dying or running away. It is obvious that winning is a function of player skill, yet it is also the function of multiple players' skills, and the other players on the team ultimately affect each others' fantasy point totals. Janus was not an awful fantasy player with NYXL, but watching him falter against his former teammates while playing on a much weaker team on Saturday was a reminder that team strength plays an important role in fantasy, as does the quality of opponent. Both of these factors are factored into the discussion of winning/losing and map-differential. In that respect, consider these statistics to be overstated, but only to a degree. Yes, good fantasy players play for good teams, and teams tend to put up more points in fantasy wins. But at the same time, expectations regarding winning/losing can help predict fantasy stats. And by recognizing the potential for a 3-2 match, you might pick up some bonus points with ease. 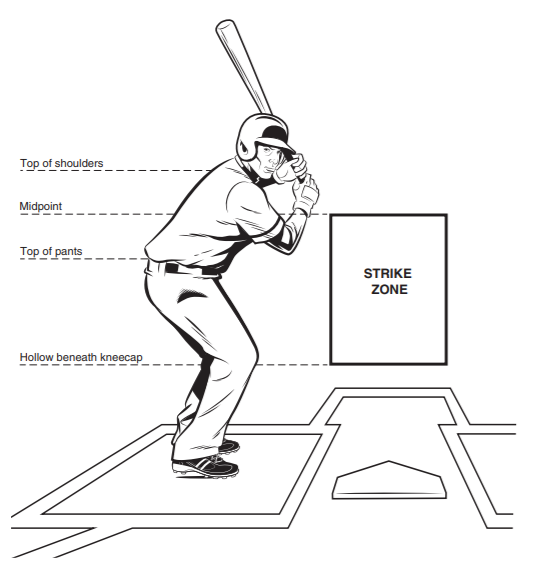 Swinging at pitches outside the zone is generally bad. After all, players are essentially giving up free balls in exchange for either a strike or a poorly hit ball. But hey, if you can put the ball in play, it's not the worst thing in the world. With this in mind, yesterday, I looked at which hitters were best at avoiding chasing those pitches, while making contact on said pitches. I decided to refine this methodology further, and talk about players ability to effectively chase in that they A. don't chase frequently, B. make contact on pitches that they chase, and C. make quality contact on pitches that they chase. The three components I incorporated were 1-O-swing% (how frequently players did not swing at outside pitches), O-Contact% (how frequently players make contact on their swings outside the zone) and xwOBA on O-zone pitches (the quality of contact on pitches made outside of the zone). After pulling all of these figures for players with 1000+ pitches this season from Baseball Savant, I then calculated the z-scores for players with regards to each metrics, then added them all together. The end result I called the "Effective Chase Score". Here are 2018's leaders in Effective Chase Score. As we would expect, Votto is miles away the best player in terms in effective chase rate - in addition to having extremely low chase rates, Votto makes contact frequently on his outside swings and has extremely effective contact on outside pitches. Here are the worst batters by the same metric. There are a lot of free swingers here, including Gomez, Davis, Gallo, etc. Baez, however, is almost as bad as Votto is good - Baez has the worst O-Swing% by 6% (Baez - 46.0%, second is Kevin Pillar, 40.5%), bottom tier O-Contact%, and Baez has just a .237 xwOBA on outside pitches. To view the full list of hitters with at least 1000+ pitches faced, I published my spreadsheet below. What's next for MiLB batted ball data? Clearly, there are issues with it, thanks to biased stringers, but there's also a wealth of valuable information in here. Having already calculated launch angle, it seems logical that the next step would be to calculate exit velocity. 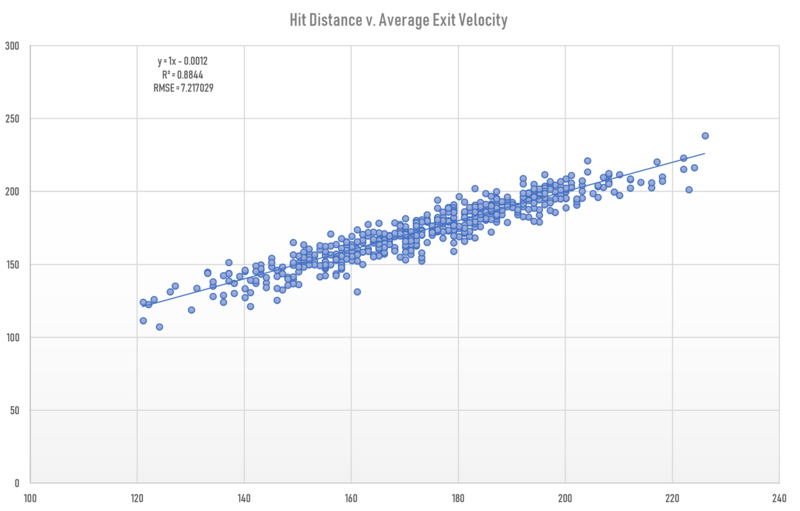 It would seem as though some relationship between hit distance (calculated using the home plate location found in part three and the coordinates of the batted balls) and launch angle would yield an approximation for exit velocity, and indeed, such a relationship appears to exist at the major league level. 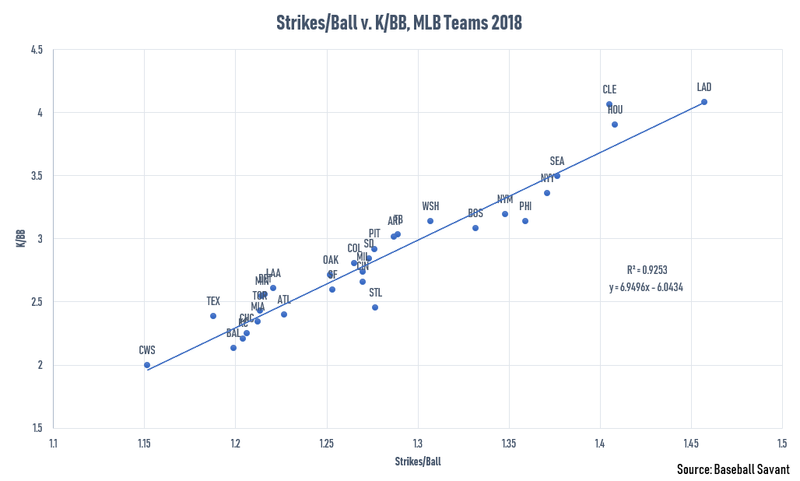 Despite this, using the model that I reverse engineered from Statcast and correcting for differences in hit-tracking between the stringers and the MiLB, I found that such a model was grossly inaccurate at the minor league level. Shown below are MiLB hitters with at least 200 BIP in 2016 and 200+ BIP in the majors in 2017. 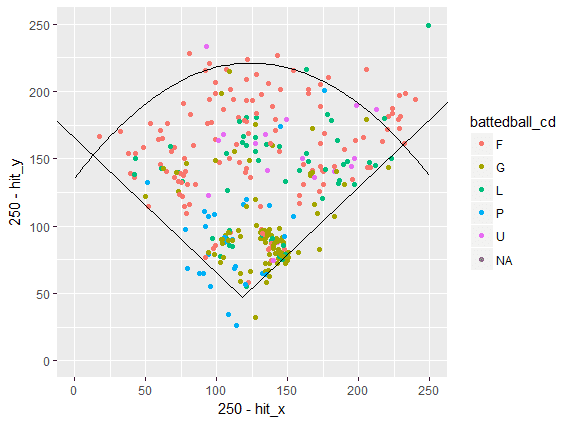 Perhaps the depth of batted ball locations are inaccurate, or perhaps the model itself has issues. I think this is a difficult challenge because we're trying to measure the size of an intangible object using its shadow - it's not as simple as plugging the values into excel's equation solver, as we need to have method behind our model. 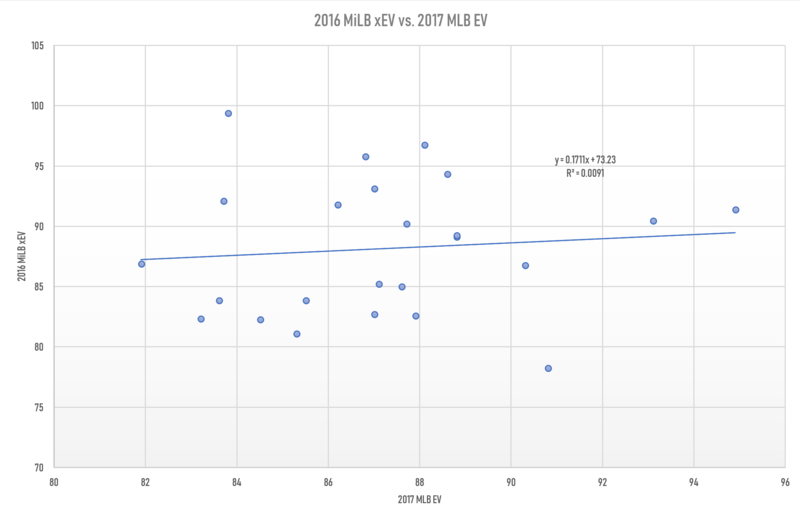 I think of this challenge as a WIP, and I hope to update this post with a solution soon, but for now I have no clear way of estimating MiLB exit velocity. Still, the rest of the data that we're working with appears solid and powerful. I've already revealed a couple functions that I've been using, and I hope to develop an R-package for all of these functions, including heatmaps, splits, date-ranges, a built-in R scraper, and more. I hope to keep y'all posted on this later this summer. Thank you for reading this series! I hope this was insightful or at least entertaining. In my opinion, not enough public analysts are using MiLB data, and while it's certainly rough around the edges, there's still valuable information to be gleaned from it. In the previous two part, we focused heavily on creating visualizations of MiLB pitch and batted ball data, but our data was not really used to create any workable number or analogs for MiLB data. I consider it arbitrary to do things like calculate batting average or slugging percentage, but methods like the ones available with regards to Statcast, such as launch angle and exit velocity. We have neither of the values available to us in any form with minor league data, but we can approximate them. 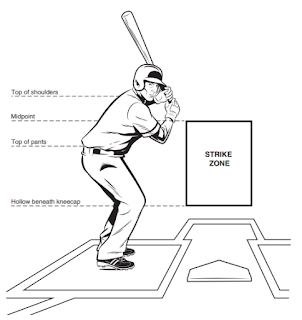 This section will focus on launch angle for MiLB hitters. 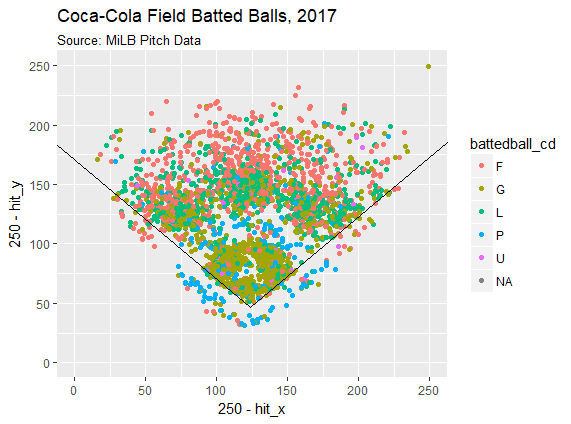 While we do not have launch angle available in any form for MiLB hitters, we do have limited batted ball classification data - stringers will manually tabulate which balls are ground balls, which are fly balls, which are line drives, and which are pop-flies. While the stringers do not operate with anything close to the precision of BIS's ball classification system, it still gives a rough idea of players' batted ball tendencies. For example, let's say we want to know how frequently Ozzie Albies hit fly balls in 2017 in AAA. There are two ways of calculating fly ball rates - FanGraphs includes pop-ups in their calculation of FB%, but Baseball Savant does not. We'll calculate both for posterity. FanGraphs has limited MiLB batted ball data from STATS, and Albies' figure for 2017 in AAA is fairly consistent with what we calculated from FanGraphs (37.9% from FanGraphs compared to 38.4% from our dataset). Albies hit fly balls in the MLB in 2017 at a 40.3% rate according to FanGraphs, and at a 32.1% rate according to Baseball Savant, so our minor league figures appear fairly accurate given that Albies' fly ball rate was consistent with his measured values both in MiLB play and in the majors. So how can we extrapolate launch angle from this? Launch angle plays a large part in batted ball classification. We can use batted ball tendencies to reverse engineer launch angle at the MLB level, and apply that to MiLB data. Using my personal Statcast DB, I found the average launch angle for each batted ball classification for all batted balls ever recorded by Statcast. Our R-squared value is .93, indicating that our formula does an excellent job of estimating launch angle solely from batted ball data - not surprising considering that Baseball Savant likely uses launch angle as a majority factor in classifying batted balls. If we re-scale our values to get a 1:1 relationship, we have a fairly strong model for estimating launch angle from batted ball classification. 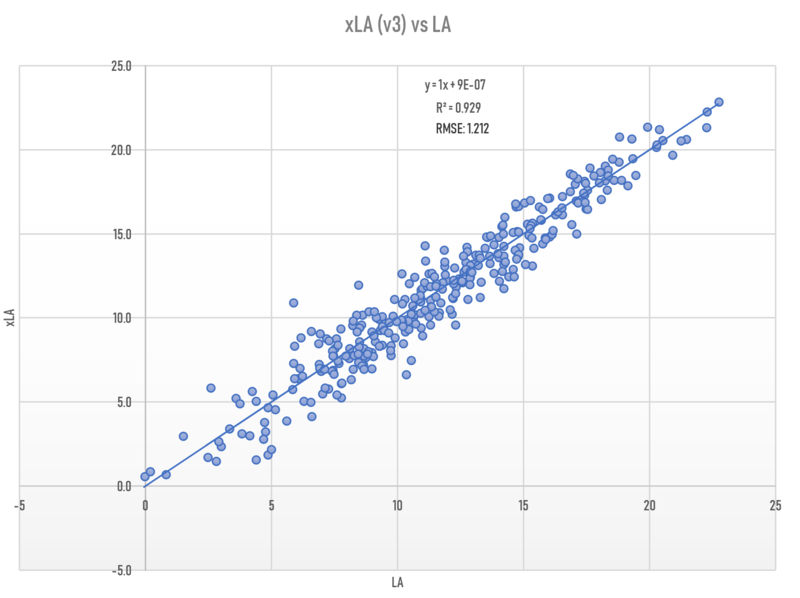 As strong as the correlation is between xLA and LA, our RMSE is a bit weak. In looking at the relationship between residual values and batted ball frequencies, it looks like we're introducing a bit of error with our POP% value. 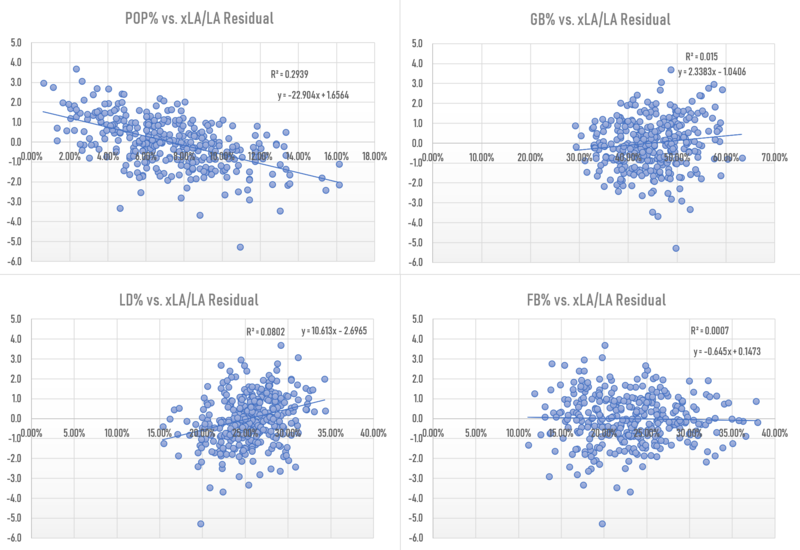 I found that my RMSE was minimized at pop-fly coefficient of about 60.65 - my guess is that since Statcast has difficulties tracking some balls at extreme launch angles, the true pop-fly angle is skewed upward. We've marginally improved our RMSE and r-squared with our model. I think there are probably some bigger steps we could take to improve the model's accuracy, but at the moment, I think our r-squared value is superb, and our RMSE value is acceptable as a model of launch angle. Armed with our model, we are now prepared to determine MiLB launch angle from the batted ball data found in our dataset. This somewhat-intimidating wall of code grabs batted ball values and calculates estimated launch angle from them using batted ball data. In our csv, we now have estimated launch angle values for hitters in 2016 and 2017 for minor league players! Of course, we need to check ourselves - how accurate are these launch angle values? 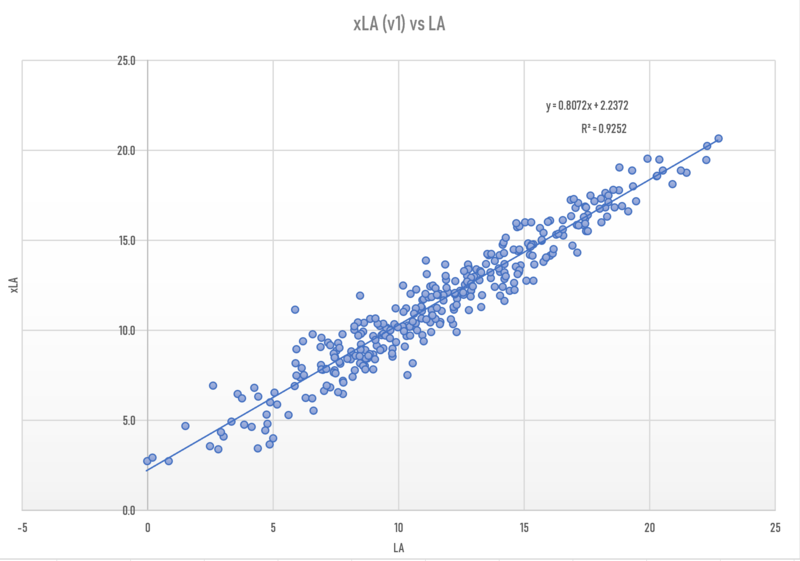 To determine the accuracy of our results, we'll compare year n to year n+1 correlation. I pulled hitters who registered 200+ balls in play in 2016 and 2017 (210 of them), and found a correlation between 2016's launch angle and 2017's launch angle of .6606, so this is our benchmark. We're not going to compare players with 200+ BIP in the minors from 2016 to players with 200+ BIP in the minors from 2017 - it just tells us the correlation between our measured values of FB%, GB%, LD%, and POP% in a rougher form. Instead, we're going to compare hitters with 200+ BIP in the minors from 2016 to hitters with 200+ BIP in the majors from 2017 - in this sense, we're looking at how well MiLB launch angle predicts MLB launch angle. Still, xLA appears to have undeniable predictive value. We have a reasonable predictor of launch angle using minor league data! 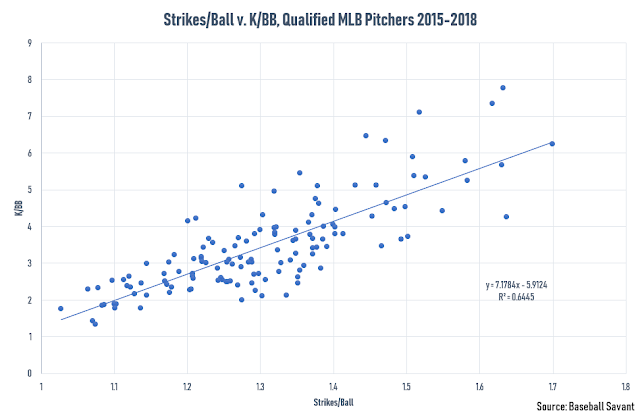 If we want to compare MiLB launch angles to MLB launch angles to draw comparisons between hitters, we now have that ability, and we can be reasonably confident in our ability to do so. In our previous section, we looked at the issues involved with minor league pitch placement data, strategies for cleaning and visualizing the data, and then compared that data to MLB data. 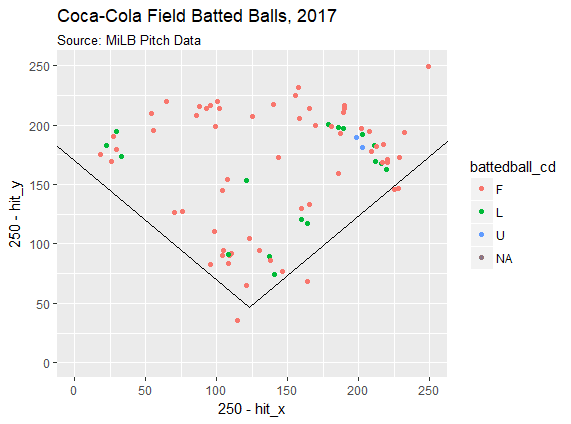 In this section, we'll grab MiLB hit data, and use similar strategies for cleaning and visualizing that data. 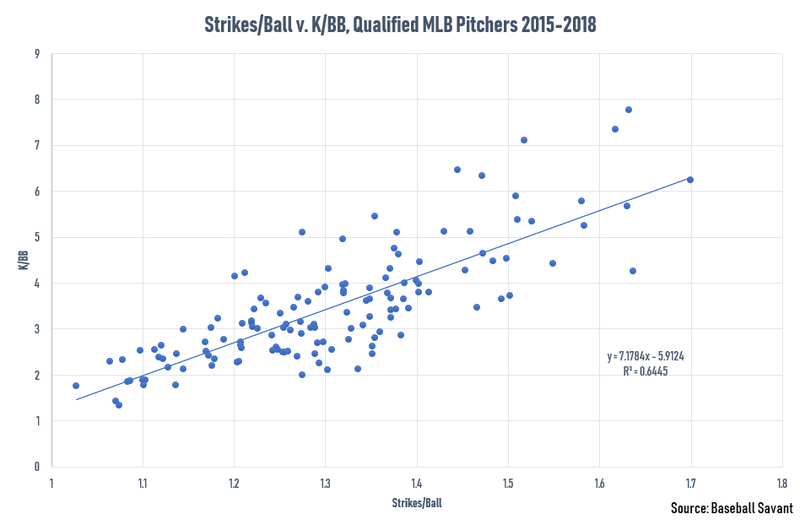 Looking at our data, we can see that we have similar issues to our batted ball data-set as we did to our pitching data-set. There exists bias in the way that batted balls are grouped - batted balls are clustered around where fielders play, especially in the outfield. The units of the x and y coordinates are not immediately apparent. The field's dimensions are not cleanly defined. We have little realistic approach for fixing our issues with the bias in clustering, but we can address problems 2 and 3. Let's start by discussing the units. When stringers are tracking a game, in order to place a batted ball on the map, they use a 250x250 pixel map of the field. Where they click is then recorded then in pixels as the location of the hit. We have to determine a realistic scale from pixel to a real-world unit in order to calculate factors like hit distance. So then, let's try to establish some concrete markers for scale. If we look at the 10th lowest y-value for ground balls for a stadium, we get a rough idea of where home-plate is. If we move that intercept down slightly and plot the median x-value of all batted balls, we should find the tip of the baseball "diamond". From here, we can construct foul-lines knowing that a baseball field is constructed with a 90 degree angle between the lines. As long as the field is not rotated beyond what we've already done, we can simply construct perpendicular lines from the tip of our diamond outward. To determine the dimensions of our park (to both plot the outfield lines and to figure out the scale of pixels to park), let's look at the placement of home runs in the park. There are a surprising number of misplaced HR balls - a bunch of long balls never left the infield, according to our data. We'll filter them out. Then, we'll plot a line of best fit along the outfield wall. This looks like a decent approximation of Coca-Cola Field's outfield wall. If we shift all the values downward, mess with the colors a bit, and we have a decent approximation of what Coca Cola Field looks like. The wall is slightly below almost all home runs. Coca-Cola Field does not have a perfectly round wall, but this approximation gives a good visualization, and looks useful for spray charts. And we can finally approximate the pixel to feet conversion factor! Home plate is at ~50 pixels, and the centerfield wall is at ~210, which gives a pixel distance of 160 pixels. In real life, Coca-Cola field measures ~400' from home to centerfield, so our coversion factor is 400/160 = 2.5. It's ~140 pixels down the left and right field lines for values of 350' down the lines. Coca-Cola Field is actually 325' down both lines, but the field itself curves inwards quite a bit. We're not quite capable of doing this with our approximation, but the values line up quite well. With all of this implemented, let's turn this into a function! 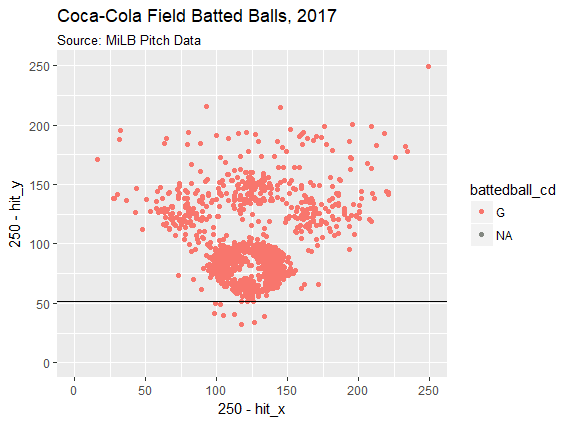 I've overlaid Rhys Hoskins' 2017 batted balls over Coca-Cola Park (no relation to Coca-Cola Field). 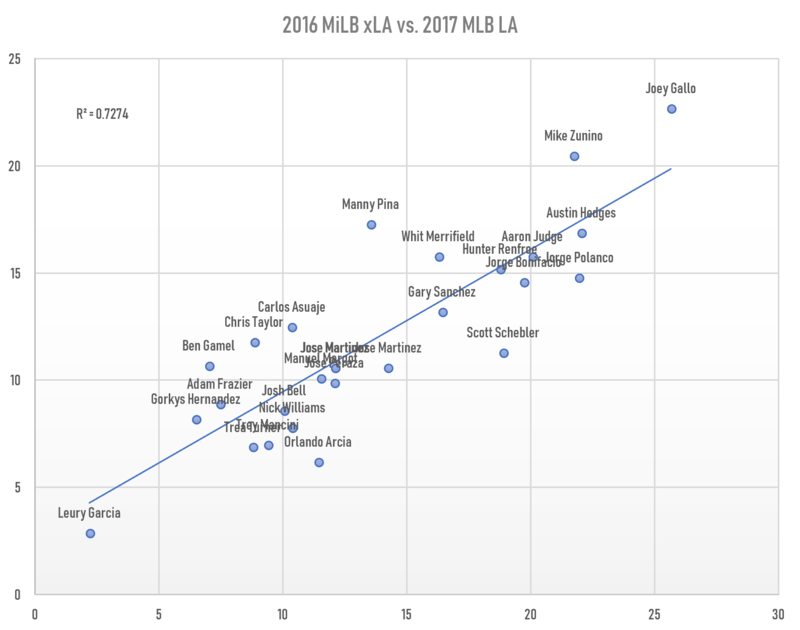 Our estimations of power look fairly accurate - Rhys has ~25 HR by my count on this chart, when he recorded 29 total in 2017 in AAA. Not bad for completely estimating the outfield wall as a semi-circle. But what's more important is the information that the chart presents - from this spray chart alone, it's apparent that Hoskins hits a lot of ground balls to the right side of the infield, making him an excellent shift target. He also has substantial pull power. We can glean this information from a scouting report, but it's important to have a visual confirmation of what's reported, and we can also pick up on systematic changes in approach. We can go deeper in terms of visualizing prospects and MiLB players.